In a nutshell: before the North End was a swank hangout for yuppies with high income and an aversion for feasts going beyond 11PM, it was a gritty industrial part of town. One large feature of the waterfront was a large molasses tank built in 1915 to store molasses that was refined by a large chemical company (USIA) into weapons grade alcohol – used extensively during World War I. In 1919, the tank suddenly burst open unleashing 2.3 million gallons of molasses that flowed like a massive brown tsunami 25-35 feet high and traveling initially at 35 miles per hour. The accident claimed 21 lives and injured scores more. I had heard bits of the story from my grandfather on a few occasions so when I saw that he had a book about the incident, my first thought was “wow, interesting!” and my second thought was “how does someone write 250 pages about this one incident and make it interesting?” This second question ended up being a dumb one as the author, Stephen Puleo, did a nice job of outlining the historical context behind the situation, the people involved, the incident itself, and the legal wrangling in the aftermath. 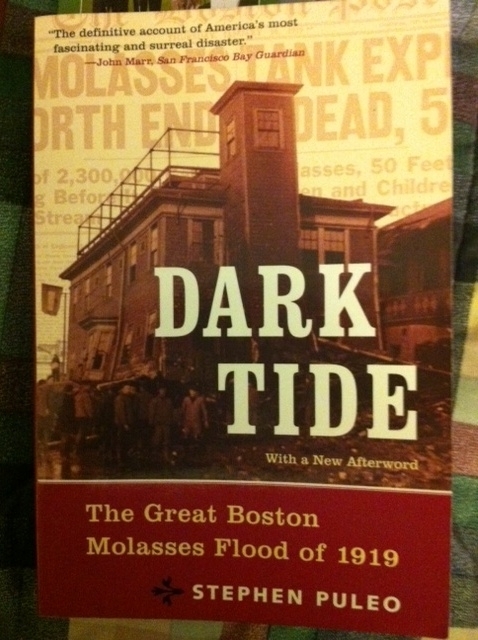 I recommend this book as a fascinating analysis of the event and the people affected and involved in the story. I swallowed 3/4 of the book in 2 days so it’s an easy read and the story makes it enjoyable to take in. Have you read this book? Do you know the story and did you know anyone involved in this incident? Please share. For more about the author and book, go to his website HERE. And by the way, I was at the Somerville Health Day at Somerville High School on Saturday April 2, where not only were various health entities there, but also some purveyors of natural/organic foods. Check out all of Burnin’ Love Sauces HERE. My Photo Included in Guide Book! Can You Vanish Without a Trace?